Olin Johannessen grew up in Portsmouth, N.H, and is the percussion section leader of the Boston Crusaders as well as the pit section leader. He attends the University of Massachusetts-Amherst, and is a music major. A busy man at college, Johannessen performs with the wind ensemble, the percussion ensemble, the contemporary keyboard ensemble, and the Minuteman marching band. Not satisfied with his musical resume? There's more. "I also arrange music for the Minuteman Hoop Band, our 70-piece basketball band (really just a huge big band with an enormous book of tunes). On the side, I also have an '80s pop cover band comprised of a bunch of my great friends and myself," Johannessen said. He began marching before entering high school. "My marching music experience began in the eighth grade, when I was asked to be in the percussion section of my high school marching band. I played both concert and marching percussion instruments, as they were all stationary in the pit area. I participated in the band through high school also," Johannessen said. ^Johannessen filled us in on his drum corps career thus far:^ "My drum corps career began in my sophomore year of high school when my band director and percussion instructor, both of whom had marched and taught a number of years in the Boston Crusaders, suggested that I go to the first audition camp for the '99 season. "So down to Boston I went, and it seems the rest is history. I have been in the Boston Crusaders' front ensemble since 1999, and each summer has posed completely different challenges for me as a musician. "I began playing primarily keyboard instruments, with the exception of the opener, in which I played timpani. My second summer, 2000, was a very different year. I had almost no mallet parts at all. I played all accessory percussion, and had a little solo. I got to march down the 50-yard line playing the "Bolero" ostinato on a rope-tensioned field drum to start out the show. I'll never forget that. "The summer of 2001 was even more different, in that I was in a section within the pit that was comprised of three percussionists, each with a separate rolling rack with tons of percussion instruments mounted on it. I think some of the most challenging musical moments can be found in my book from 2001. Really cool percussion sounds and grooves rounded out our show, "Harmonium," which has come to be one of my favorite drum corps shows. "It seemed to us at the time that the summer of 2002 would be a season of rebirth and opportunity. This is most certainly true in regards to my experience as well. I went to the completely opposite side of the 2001 summer, and played almost no percussion, strictly keyboard. I remember only moving from my marimba for the ballad. "It was a great show, and I really enjoyed feeling almost like an orchestral percussionist may, in that I could just stand at my keyboard and let the music around me just happen. It felt like I was just floating right on top of it, adding in my own voice to augment what was going on around me. My most recent season, 2003, found me not only playing marimba, but also vibraphone (in our ballad) and timpani. I was very fortunate to share what we call "the hot seat" (really the only seat on the field) with a great friend of mine who had been our incredibly talented timpanist since the summer of 2000. "Last summer I played timpani through the entire opener, and then for the percussion feature inside the closer. It was neat to have that challenge also. I think that, given my wide range of musical roles in the front ensemble, given the number of years I've been involved with drum corps, and given my personal strength, I am well prepared to be the leader of the Boston Crusaders percussion section. "It may seem strange to have the section leader be someone in the pit, rather than the center snare or something, but I think that it's going to work. I can say that being involved with Thom Hannum, and by being both in the marching band, the keyboard ensemble, and the basketball band, I have been "in training" to be a reliable leader and role model. Thom really commands your greatest effort as an individual, and has a tendency to bring out your potential as it concerns to contributing to the betterment of the team, whichever one it may be." The last good book I read:"We the Living," by Ayn Rand. The last great film I saw: "Big Fish," directed by Tim Burton. Three CDs I'd want on a deserted island:"The Best of Earth, Wind and Fire, Volume 1," "A Decade of Steely Dan," and the soundtrack to "Catch Me If You Can," which was scored by John Williams. My favorite TV show: "The Cosby Show." I gotta love that family. My favorite performers: Well, I'd have to say seeing Michel Camilo playing with Anthony Jackson and Horacio Hernandez at Scullers Jazz Club in Boston (albeit eight years ago!) is still the most memorable performance I've witnessed -- although I must say seeing the Madison Scouts perform "Jesus Christ, Superstar" on semifinals night in 1999 in Madison was pretty amazing. How do you "blow off steam?" I blow off steam by taking deep, deep breaths and trying to exercise control so that I don't freak out. Then after I'm calm, I'm able to talk about what is bothering me. Why do you march where you march? I march with the Boston Crusaders because I know that I am involved in an organization that is just a little bit different. We approach marching music in a different way, treating it as an art form, not just in the musical sense, but the entire intent of the production. Our shows are designed to elicit emotions and feelings, and show audiences everywhere that drum corps isn't just about trucking it around the field at 200 beats per minute ramming notes. It's about making a presentation that people can enjoy, relate to, and cherish. Was it always your goal to be percussion section leader?It was not always my goal to be in a leadership role. How will you go about balancing the roles of leader and corpsmate? I will balance my roles as leader and performer/member by always having the performing side down pat, so that if something is needed of me as a leader, then I can quickly and effectively respond without having to worry about the musician side still being there. I know it will be there, so that gives me the necessary energy to manage our percussion section. What has been your formative drum corps moment? My most formative drum corps moment was probably finals day last summer (2003) when the pit was loading up the equipment truck. We'd had a very turbulent day, with the weather, and the uncertainty of whether we would get to perform the show that night. As we were packing up, I said to my section leader, an age-out, "Sean, this will never be the same, ever again." Sean and I had marched since 1999 together, and seeing him go, along with two of my other best friends from the pit, was so difficult for me to handle. As this epiphany sunk into me, I simply began to cry, realizing that nothing in life is permanent, no dynasty, no matter how long it may last, is forever. Nothing can have any value if you can hold it forever; yet at the same time, letting go is one of the hardest things to do. I must've sobbed on and on for about an hour, trying to lift the timpani into the truck; rolling the marimbas through the sand, up the ramp, into the bay ... it will never be the same, ever again. Best drum corps show ever: Ahh, so many angles, defining features, so many choices! I suppose the most unconventional show would be Star of Indiana, 1993. 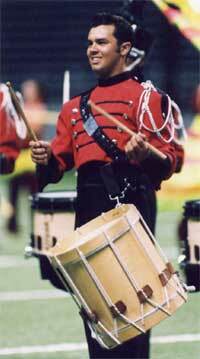 The most accurately written show (musically speaking, from my point of view) would be Crossmen, 1998. I love that show. The Garfield Cadets hold a special place in my memory for their 1987 show. And of course, the Santa Clara Vanguard's embrace of "The Phantom of the Opera" in 1989 was incredible. I guess my favorite show is a musical mixture, a joining of two of my favorite composers (Bernstein and Tchaikovsky) in the Blue Devils' 1998 production, entitled "One Hand, One Heart." That is my favorite show. What are you most looking forward to about the summer? I'm looking forward a lot to playing the music this summer, as it promises to be very challenging, interesting, and exciting! I'm also looking forward to improving some of the bad habits that we may have in the percussion section, so that the drum corps can continue to grow, even after we are all gone and aged out. It's important to instill good habits, because once they are implanted, then they become the new standard, the new habit. Best thing about being a drum corps leader:The best thing about being a drum corps leader is having the ability to institute change and show others, without needing to say anything at all, how things should be done. The true sign of a good leader is that he doesn't need to say two words to get something done, because others look to his example, and follow willingly, trusting his instincts and motivations. Worst thing about being percussion section leader: Man, I don't know yet. So far, things have been pretty good. I'd imagine that if there were a problem, then dealing with it would be difficult. I must say that part of being a leader is being ready to take the bad with the good, and cope with them equally. I sure hope there's nothing that bad coming my way ... During tour, the best part of the day is: The best part of the day on tour is probably after shows, when I get to hang out with my friends from UMass and from Crusaders at the same time. We all hang out, eat snack together, and just shoot the breeze. During tour, the worst part of the day is: The worst part of the day on tour is simply waking up. I've never in my life had an easy time of waking up. It's even harder on tour. At least I have the safety net of the pit to wake me up. We all sleep near each other in the gym so that we can wake up together and unload the truck. Favorite drum corps personality and why: My favorite drum corps personality would have to be DCI contest coordinator Tony DiCarlo. He's always there at the big shows making sure that the Boston pit has everything we need to get out onto the field and play great. What do you want to be when your drum corps career is over? When my drum career is over, I'll be in Denver because of finals. I figure, I've never seen California. Maybe I'd like to find myself there.